No Charms are required to attract the Ravenous Zombie Mouse. Arming Brain Charm or Super Brain Charm increases the chance of encountering the Ravenous Zombie Mouse. Hunters can encounter the Ravenous Zombie Mouse in the Catacombs, Forbidden Grove, and Mousoleum locations. The Ravenous Zombie Mouse is known to drop Brain Bits in any location when hunting with the Limited Edition Brain Extractor or Maniacal Brain Extractor traps or Skello-ton base. The Ravenous Zombie Mouse is known to drop Cemetery Slat, Wealth Charm and Super Wealth Charm in Mousoleum. The Ravenous Zombie Mouse is not known to drop any other loot in Catacombs and Forbidden Grove. Attraction info and special event loot drops for the Ravenous Zombie Mouse can be found at the individual event location pages. The Ravenous Zombie Mouse drops the Haunted Egg during the annual Spring Egg Hunt. 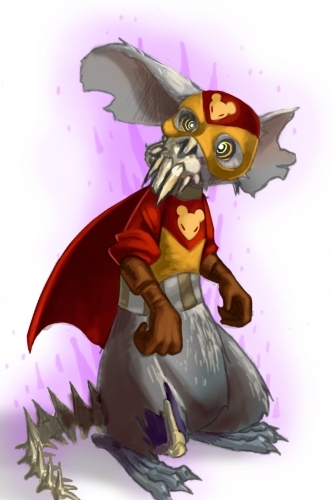 21 July 2008: The Ravenous Zombie Mouse was introduced. 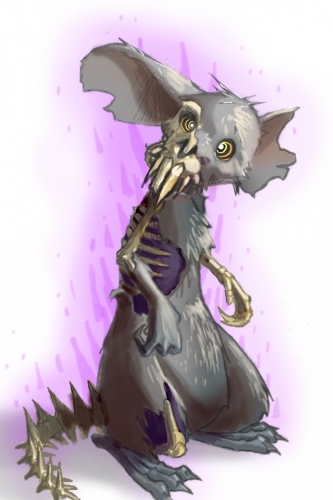 12 January 2011: The Ravenous Zombie Mouse was found at Ronza's Traveling Shoppe for the first time. 18 April 2011: The Ravenous Zombie Mouse began dropping the Wavy Purple Egg as loot as part of the Spring Egg Hunt 2011 event. 26 May 2011: The Ravenous Zombie Mouse began dropping Undead Emmental Potions as loot in the Mousoleum in preparation for the Zombie Invasion Weekend. 27 May 2011: The Ravenous Zombie Mouse was re-introduced to the Catacombs where it began dropping Undead Emmental Potions (only during Zombie Invasion Weekends) as loot and gained a preference for Undead Emmental cheese. This page was last edited on 7 April 2019, at 11:26.